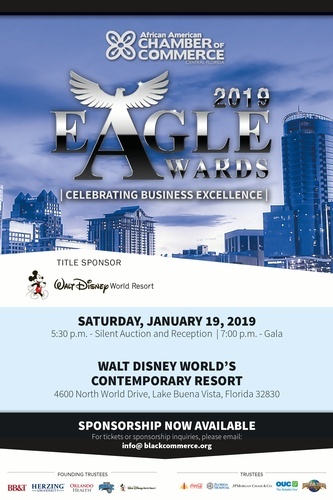 The African American Chamber of Commerce of Central Florida is proud to announce the 2019 Eagle Awards presented by Walt Disney World! Join us on January 19, 2019 for an exciting evening of exquisite dining and entertainment as we celebrate the most dynamic business entrepreneurs and corporations in Central Florida. Attendees will also have an opportunity to participate in our signature silent auction reception for an opportunity to bid on spa packages, resort getaways, theme park passes, golf experiences, and much more!